Start your free 14-day trial today for better sleep with RestUp - America's #1 Non-Habit Forming Sleep Aid. It’s time to sleep. You shut down Netflix. You brush your teeth. You turn on the fan and crawl into bed. You’re about to close your eyes, but then you think of something. You haven’t checked Facebook in a while. You pull out your phone and scroll down the timeline for a few minutes. You shut it down, plug the phone in, and roll over to sleep. Then you’re awake for twenty minutes before you finally drift off. Why? Almost all smartphones blast bright blue light from their screens. Scientists have found that your brain associates that bright blue light with the morning and gets your neurons firing. When you get on your phone late at night, even if you want to go to sleep, you’re telling your brain that it’s time to wake up. The best way to avoid this is to put your phone away before bed, but if you don’t want to do that, there’s an easy way to have your phone and get sleep too. If you have an iPhone with iOS 9.3 or later, this is the easiest thing in the world. You just go into settings, find the display/brightness section, and click on Night Shift Mode. 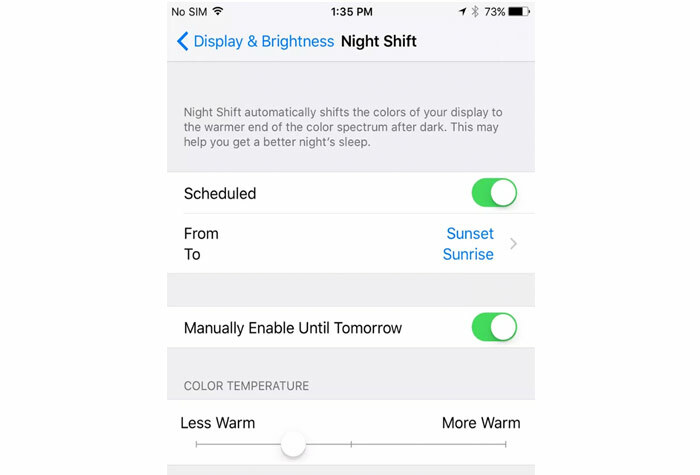 In that menu, you can set a schedule for when the screen changes, and determine what color temperature it generates. On Android, it’s a bit more difficult, but hardly challenging. You need to go to Google Play and download the Twilight app (you can do that here). 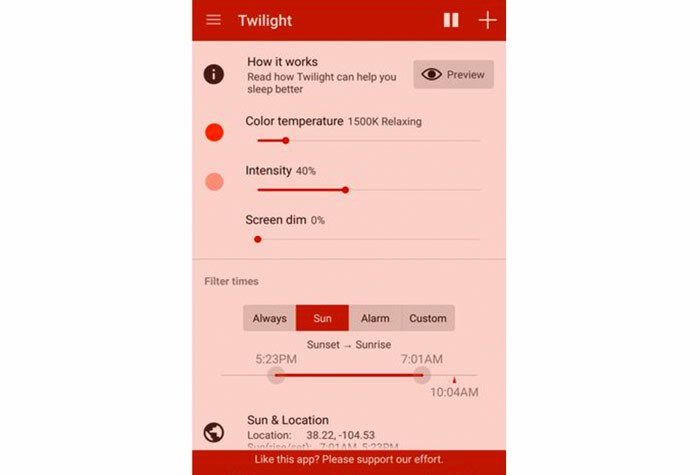 That app adjusts the brightness and color of your phone’s light based on time of day. It adjusts its internal settings based on your GPS location, so once you have the app set up, you’ll be good to go. Android phone with all blue light filtered out. Those simple steps can make the transition from phone time to bed time easier than ever, and help you get the rest you need to operate at peak performance.